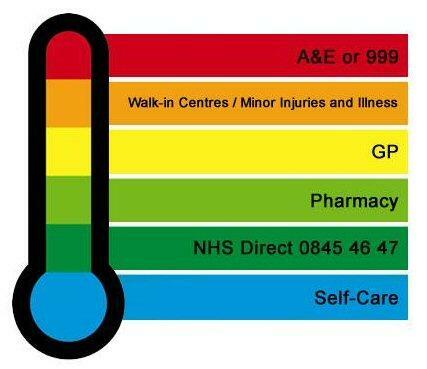 Remember A&E, emergency and 999 services, are for serious and life-threatening conditions and injuries only. Did you know that common complaints such as coughs and colds, stomach upsets, sprains and strains, insect bites and allergies can be treated at home or by your local pharmacist? Choosing the right treatment and services will help you avoid unnecessary visits to your GP and Out of hours service or lengthy trips to A&E. If you need a doctor in an emergency please click on the 'Opening Times' tab at the top of the page and then the 'when we are closed' option. If you are interested in joining the group please see further details in the Patient Group link on this website. Please note that we are no longer printing off all of your medication when you place your order. If you require a list of your current medication please ask the receptionist to print a copy for you.